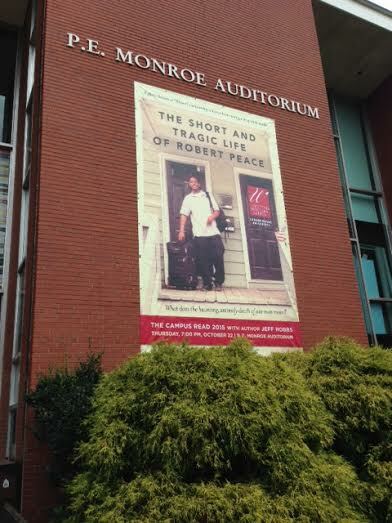 The large banner that hangs beside the entrance to P. E. Monroe auditorium suggests that The Short and Tragic Life of Robert Peace figures prominently on campus as this year’s common reading selection at Lenoir-Rhyne. But unlike the books that many other colleges and universities choose for their incoming freshman class, Jeff Hobbs’ biography of his Yale roommate wasn’t the subject of orientation-week discussion groups and isn’t required reading for all sections of FYE (First-Year Experience) or English 131 (Critical Thinking and Writing). Even so, I included a study of it in my English 131 classes to give Hobbs’ book its due as the campus common reading. For my students and me, the biography served not only as a subject of textual analysis but also as a starting point for a conversation about the common reading programs that so many colleges have adopted in recent years. Last semester and again this semester, I wrote an essay on the book along with my students. Unlike the one that I posted to my blog last semester, the one that follows isn’t a revised and expanded version of what I wrote longhand while my students wrote. Instead, it’s simply a typed version of what I wrote when I put pen to paper in class on March 9. In Part Four of The Short and Tragic Life of Robert Peace, Jeff Hobbs recounts the hours Rob spent mentoring Truman Fox, one of the water polo players he coached at St. Benedict’s when he returned to his alma mater to teach biology. After observing Truman’s laziness, evidenced in the way he “tiptoed along the bottom during laps” (267), Rob says to Truman: “You’re not making it hard” (268). Those words of Rob’s inspire Truman to take more initiative, and the following Saturday when Rob heads to the weight room to open it for a voluntary training session, he finds Truman in the hall waiting for him. Hobbs writes of Truman that “[h]e felt that if Rob saw a spark in him, even if Truman himself did not, then it was his responsibility to stoke it” (268). Rob’s time with Truman echoes his tutoring of his high school friend Tavarus Hester. And later after Rob leaves his teaching position at St. Benedict’s, he reprises that tutoring role, helping Dawn—the daughter of his airline co-worker Lisa Wingo—“guid[ing] her through fifth-grade reading lists and simple division” (314). With Tavarus, Truman, and Dawn, Rob models the same self-discipline, but the passage that chronicles his conversations with Truman differs from the others, revealing the dark side of Rob’s determination, a side that remains unseen to Truman: “[W]hile he and his teammates were changing back into dry clothes, his coach was mentally preparing to spend the night dealing drugs” (268). The stress of Rob’s post-Yale days, Newark-proofing himself and negotiating and compartmentalizing his identities, explains how the same Rob Peace who aced his molecular biophysics and biochemistry courses at Yale failed the Realtor’s exam, not once but twice. If he had pored over his notes for that exam with the same focus that he gave to perfecting Sour Diesel, his hybrid strain of marijuana, he probably would have passed the Realtor’s exam on his first try. The fact that he didn’t underscores what his friends saw with clarity but Rob himself could not. What ultimately stopped Robert Peace wasn’t a weakness plain and simple but a more complicated trait, one that could be a strength—and usually was—but that became a weakness when he found himself “focusing that unstoppable drive on the very thing that could stop him” (311). Thanks, Jane. Interesting. I don’t know the man’s work but will check it out. Well-writes as usual. My news is that I have a book coming out in August. And working on another when I have the time. Hope you’re doing well. Jamie plans to teach a novel class this summer. And of course I’ve signed on board. He’s such a great teacher.